Summary. The pictogram is warning about start of the first pre-cataclysm in the shortest time. It informs that civilization of Earth has to make decision about unification of consciousness as soon as possible. This is because humanity to be saved from global cataclysms has to make the Transition on the safe level of the material world. The Transition has to be made immediately after the first pre-cataclysm before the second pre-cataclysm. Because after the second pre-cataclysm quantity of people will be not enough to make the Transition. Remained after third pre-cataclysm small part of humanity will be destroyed by global cataclysms beginning shortly. Unusual technics of this crop circles manufacturing and also some details specify that this drawing can be hoax. Nevertheless, ETC symbols of consciousness used in this crop circle allow to read this pictogram. On the pictogram is shown a big circle representing a huge brain area of the united cell of Earth civilization which has to be formed for the Transition on the Highest level of the material world. This is ETC instruction about necessity of consciousness association for life salvation at approach of global cataclysms which will begin in the near future. It means mankind’ Transition to the Highest level of the material world, in the next cycle of a life. The reason which has caused this necessity, is shown in middle part of this circle in the form of the dual figures reminding hysteresis loops. In ETC symbolics of consciousness a hysteresis loops specify on threat magnetic field of Earth for mankind life. Loop of the hysteresis, specifying on critical decreasing of Earth magnetic field, are presented in many crop circles. The figures reminding hysteresis loops form the closed ring in which the big dark area also represents brain area of the cell of united consciousness, but not all civilization, but only a considerable quantity of people. It specifies that Earth civilization is prepared for association of mankind consciousness. There are already huge groups of people constantly uniting consciousnesses with the uniform purpose – collective meditations, such as Global Meditations Network, collective prayers and others. Sometimes planetary events also unite consciousness of hundreds of millions people on the planet. For example, event 9/11 in USA, tsunami in southern Asia, Eastern Japan Great Disaster in March of a 9.0 magnitude earthquake and tsunami, Chernobyl etc. Today words of sympathy sound worldwide to the Norwegian people for the horrendous act of terror. In this case the second dark external ring represents wide border of united consciousness cell of big groups of people. The wide border points on absence of mutual understanding between people of the planet, causing wars, struggle for political ambitions and the power, indifference to destinies of other people. In this case, the block reminding hysteresis loops, is located in the cell’ body area. It specifies that our life is under huge threat of critical decreasing of our planet magnetic field. On the other hand, the dual figures reminding hysteresis loops, in both parties – external and internal, form the figures reminding bells. The shape of bell represents expansion of a brain area which accompanies association of consciousness. As it is known the Tsar-Bell which is located in Moscow, does not call, because of split off a piece. It is the Bell – invalid. It cannot fulfill its mission – to call people, alerting about the major life critical events. ETC in thousand of pictograms present this information, underlining what a great mission should we have to achieve and urge to make the decision about consciousness association, as soon as possible. However, today mankind as well as the Tsar-Bell cannot fulfill its mission. For creation of high-grade homogenious consciousness of a civilization there is not enough possibilities. Our association of consciousness is only prepared. We need to make the Transition, instead of remain in a mode of individual consciousness the same invalid as the Tsar-Bell, and to be ruined in global cataclysms of our planet destruction. Thus, is shown the way out of the critical situation dangerous to people of the planet. This way is association of consciousness of all civilization. Expansion of bell-shape figures both external and internal, is directed towards the expanded areas of brain corresponding to association of mankind consciousness. The represented bells call mankind for consciousness association – the basis of the Transition in a new cycle of life. Otherwise we’ll be destroyed by global cataclysms. From this point of view, the figures similar to hysteresis loops, remind images of fishes. This is a harbinger of the first preliminary cataclysm, which epicenter, as specify extraterrestrials in other pictograms will be in the ocean. The pictogram 30 July 2010 at Berkshire and Buckinghamshire, England indicates the epicenter of the first preliminary cataclysm in the area of the Brazilian Magnetic Anomaly and the direction of further action as super-powerful tsunami which will pass through east coast of the North America. The intensity of human losses on both continents shows small and large circles, arranged in parallel lines. 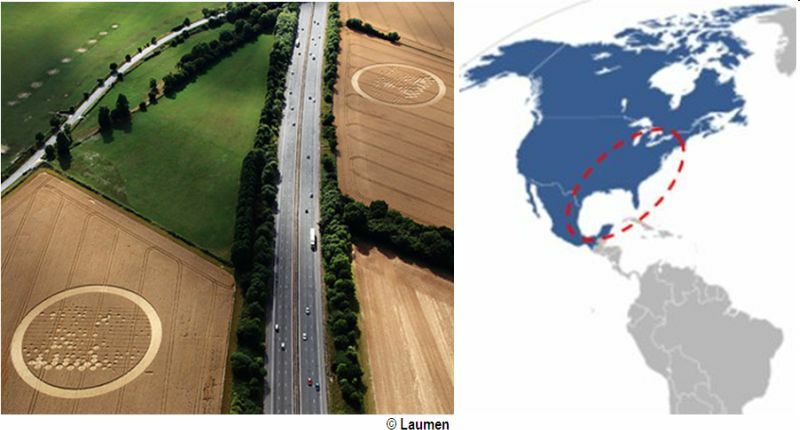 The road is the ocean that separates two continents – North America and South America presented by two circles. Ancient complex of Chan-Chan in Peru supplements this information and indicates that the first pre-cataclysm will occur in the Pacific Ocean from outside Peru, at the intersection of Humboldt current, which runs from south to north, with El Ni?o, which runs parallel to the equator. This information is presented in details in our decoding of the pictogram 30 July 2010 at Berkshire and Buckinghamshire, England on our decoding pictograms of the 2010 crop circle season on Crop Circle Connector at www.cropcircleconnector.com and also on our website: www.ourtransition.info and also in our article about Chan-Chan on our website. Style of the pictogram performance is very unusual. In crop circle there are no standing ears. All plants are laid horizontally. One or other part of crop circle is allocated only by turns of stalks. This way is represented the homogeneous structure untied with the material world. 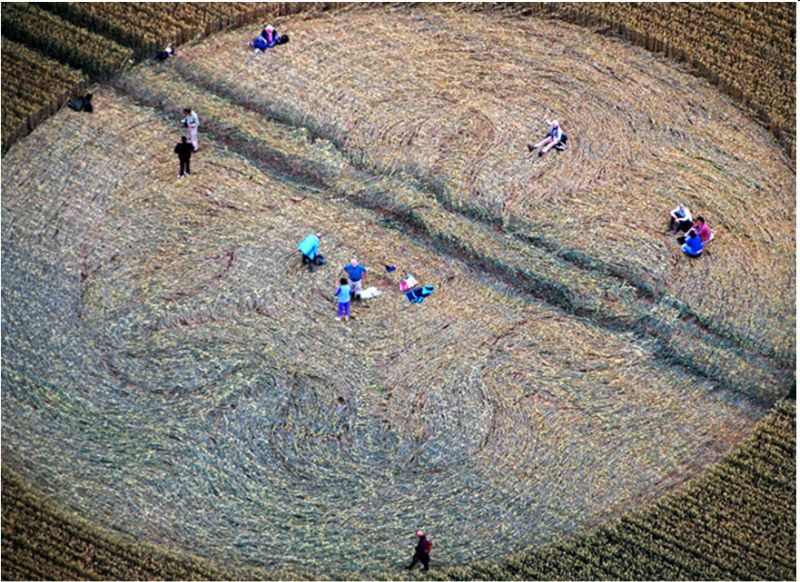 All previous crop circles even the three-dimensional were carried out in three planes – horizontal and vertical. Thus, in a vertical plane a brain area has been shown which was represented by the twirled bunch of grass. In a horizontal plane a body area and border of an information cell were represented. By these two planes – horizontal and vertical was made division of areas of the present and the future which is outside of the mankind cycle of Consciousness. Its external part becomes the present only in the beginning of the next cycle of Consciousness which will begin after the cycle of Correction in which we now transfer. The information world is layered and the same as the material world contains three levels – the present development of consciousness; area of near future development of consciousness and area of far future development of consciousness. In the brain area of the cell is put the information of improbably far future corresponding to all cycles of development of human being. 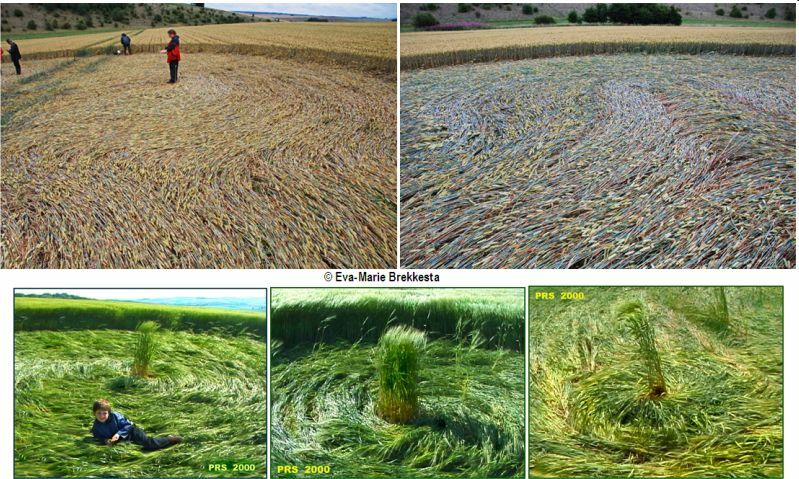 The presented crop circle is completely manufactured in one horizontal plane and does not contain vertical elements. As it is known all pictograms on fields – crop circles are made by consciousness symbols. Hence, they transfer information from the Information level of the Universe. Absence of vertical elements specifies that all elements of the pictogram are in present area. As show previous pictograms on fields ETC warning information is realized in 1-2 months by the events in the material world. 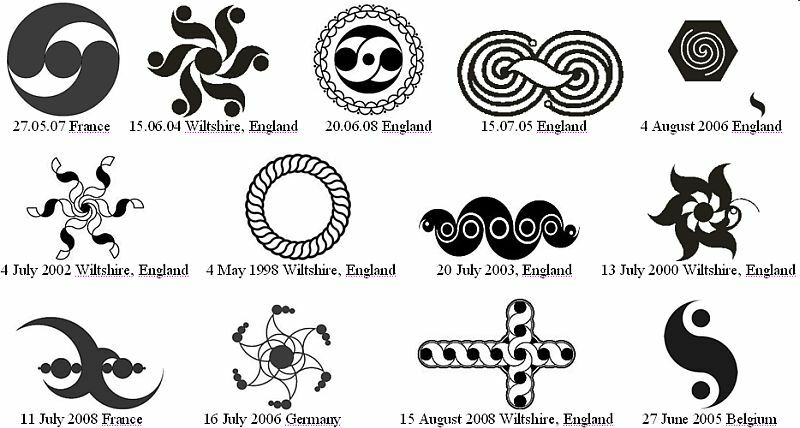 In all crop circles ETC symbols of magnetic field are combined with symbols of mankind life – information cells. It shows dependence of mankind’ life from condition of Earth magnetic field. So, for example in 2000 ETC warning about critical decreasing of Earth magnetic field was presented by a huge crop circle reminding image of magnetic field on 22 July, 2000. ETC warning had been realized in material world on 22 September, 2000, exactly in two months, by record unprecedented sizes of ozone hole over Antarctic with area of 29,2 million кm2. This way was confirmed ETC warning of dangerous condition of Earth magnetic field. Since 2000 the symbolic of Earth magnetic field danger appears only at its critical changes 1.5-2 months prior to ozone hole disclosing. Tragically, it happened almost annually. Hence, the events represented on the pictogram if it is only not a hoax, will arise in the material world during the specified term. Probably this is a warning about the first pre-cataclysm events. This way is shown the phantom of events which already stands in our civilization cell and will be revealed during the specified term. 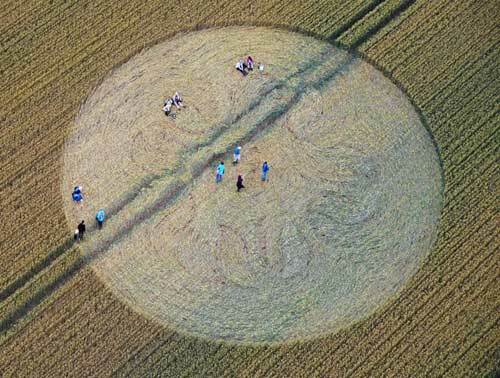 Crop circle with similar style of manufacture of separate elements also reminding the phantom, has been represented on fields on July, 10th 2010, Guys Cliffe, Warwickshire, England. Pictogram warned that if we will not unite consciousness and will not make the Transition life-cycle of each of us and whole civilization will be not finished. Consequently, our civilization will be the civilization of ghosts. About water elements in which the first preliminary cataclysm will develop, spoke also the well-known American prophet Edgar of Cayse. He foretold that the face of the Earth within several moments will be changed beyond recognition, and waters of the Mexican gulf will joint to Great Lakes. E. Cayse pointed that the hope of the world for salvation will come from Russia. It will be not communism, but other relations on our planet of mutual-dependent people when everyone is responsible for another and people are united by the uniform purpose. The way of salvation about which spoke Cayce means the formation of the united consciousness of civilization on which specify extraterrestrial civilizations in all their pictograms decoded by Russian scientists. Russian scientists have made also the dictionary on more than 250 ETC symbols of consciousness. And now everyone can read ETC messages to earth dwellers and their appeal to change the mode of consciousness from individual to united. It means the transfer from the fourth individual level of consciousness to fifth level corresponding to the united consciousness. ETC transfer information about necessity of the united consciousness formation in many crop circles through five-pointed star. Civilization' united cell corresponding to the fifth level of consciousness is clearly presented in the Cave of the Hands in Argentina by famous color paintings of numerous small left hands made about 9,000 years ago. Five fingers in each hand point on the fifth level of consciousness – the united consciousness. The left hands specify that consciousness association should come from heart. Small size of hands means that for consciousness association is required spiritual, but not physical power. Bright colors of the composition pay attention to this major instruction of ETC – unification of consciousness. ETC warn that cataclysms will never stop, but will amplify, because it is connected with a phase of destruction of our planet. So, people cannot hide in bunkers or submarines and wait, when cataclysms will terminate, as it is shown in a film 2012. During cataclysms mountain will turn to sand heaps as is specified in Holy Scriptures. Gradually our blossoming planet Earth will turn to the deserted surface reminding Mars. However, this total destruction of our today's comfortable and reliable house – planet Earth – will not affect us. We will be on the safe Highest level of the material world and continue life in the new cycle of Correction in which there are only two categories – hell and paradise, and everyone will be responsible for his actions. So, do good today! This way the mankind will escape from the uncontrollable and inevitable global cataclysms connected with a phase of destruction of planet. Our Transition on the Highest level through the united consciousness is the only one way for continuation of our life. Our Transition will not affect anyone’ private property.